Hola Lovelies! Hope you’re all well and eating good! 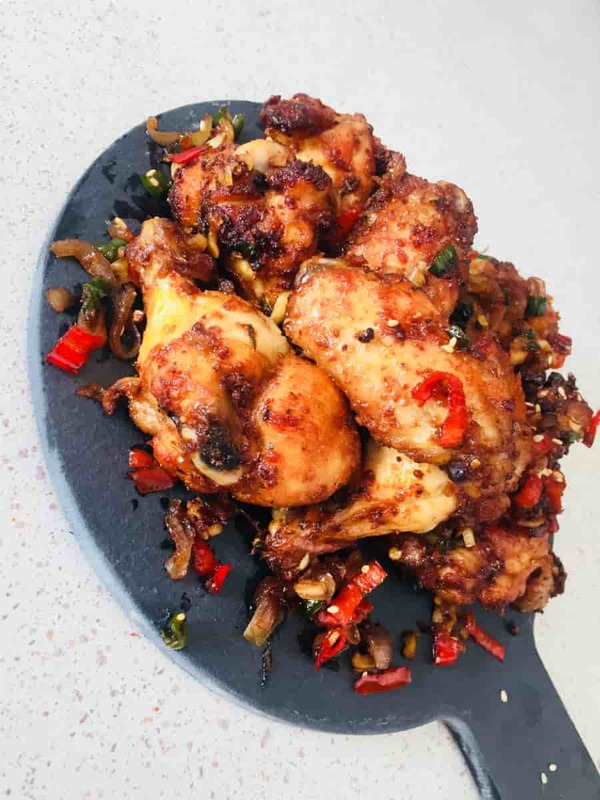 Earlier on this week I was craving some wings but couldn’t decide which flavour I wanted.. so I asked you guys on social media which recipe you’d like to see and it was Salt and Pepper wings! These wings are really simple to make and I KNOW I always say that but that’s the aim of my recipes right? Well, I’m serious they are easy to make and they only require a few simple steps as well as a (not so) secret ingredient that gives you crispy, crunchy and healthy wings without using a deep fryer, flour or any of that extra stuff. I urge you to watch my video recipe (click the link) as I explain how to divide the chicken wing into 3 parts and how to use the baking soda to crispen your chicken! If you’ve been following my blog for a while then you might recognise this ingredient and these steps from my Honey Siracha Chicken Wings! recipe! Well it’s pretty much the same steps in this recipe just an upgraded version in that I’ve balanced out the flavours a bit. Looks like a lot of steps and ingredients but it’s all about what’s in your cupboard, I recommend prepping before you start to cook and cleaning as you go! Once you have sectioned your wings, make sure they’re washed and dried. Once the wings are seasoned, sprinkle half of the baking powder onto the wings and use tongs/spoon to mix thoroughly until the baking soda disappears. Repeat this step with the rest of the baking powder. On a wire rack or baking tray, arrange the wings so that they all have space in between themselves! Make sure the tray isn’t crowded as this could cause soggy instead of crispy wings. Turn the chicken wings over again after 15 minutes or until the sides are nice and crispy, set them aside to cool. Your wings can take anywhere from 35-50 minutes! Give them time to crispen up and turn them over every so often. Don’t worry, they’ll still be moist and juicy inside. In a frying pan or wok, heat the vegetable oil on medium high heat and add the onions. Stir fry for 2-3 minutes until softened then add in the chilli and stir fry for 2-3 minutes. Add in the garlic and turn down the heat if necessary to make sure they don’t burn. Once the garlic smells fragrant, add in the rest of the ingredients (soy, sugar, honey, sesame oil, pepper). Stir fry for another minute until all the flavours come together, then add in your wings and toss to coat. Coat the wings as best as you can and serve! This can be enjoyed on its own with a cool drink or scoop up the chilli mixture and serve with rice! Thank you for visiting my blog, I’d love to hear from you! Feel free to leave a comment, send me an email, or find me on Instagram, Snapchat and Twitter & and please SUBSCRIBE to my Youtube @FoodwithDom.